When my 1989 4-cylinder Chevy S-10 pickup truck finally died I went looking for a car better suited to a 65 mile (each way) daily commute on Indiana's part I-65. Great gas mileage, good value, and good reliability were the main factors in deciding which car to get. The high MPG used cars I looked at were either over-priced (like a 15 year old Geo Metro for $4000) or had serious mechanical issues, so a new car was the way to go. The Chevy Spark and the Mirage DE were the key contenders with the Nissan Versa being quickly knocked out at 36 MPG highway and only a 60k power train warranty. Hybrids were also out with their ~50% higher price tags (Prius C) and only marginally better highway mileage. While the Spark has better interior/exterior styling and handles a wee bit better on the highway, those factors didn't trump the better mileage and comfort features (climate control, stereo with a USB connection so I can listen to audiobooks, etc.) of the Mirage. 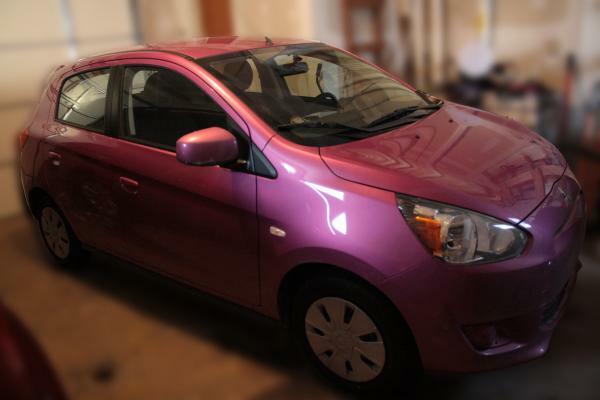 Despite the 74 horsepower engine, the manual transmission Mirage has plenty of power and acceleration to get up to highway speeds (60-75 MPH) in the length of an on-ramp. Compared to the old 92 horsepower truck, the featherweight Mirage feels like a sports car and if the even smaller 1.0l engine was available in the states, that's the one I would choose. Doing around 60 MPH seven car lengths behind an 18-wheeler, the Mirage engine is pegged at right around 3000 RPM and over the course of the 65 mile commute the average MPG of the trip slowly rises to between 48 and 52. Even without a using an 18-wheel wind-break, the aerodynamic shape lets the car get 45+ MPG at 60. Bumping the speed up closer to 70 causes the mileage to drop to around the EPA rated 42 MPG. With a top speed around 100, I didn't get this car expecting to be hanging out all day in the far left lane. As others have pointed out, the suspension on the Mirage is rather soft which makes the car seem a bit wobbly sometimes. The Mirage is not the car I would want for zipping along the curvy Mulholland Drive, but it is just fine for a straight and boring drive on the interstate. One nice thing about the soft suspension is that this car takes potholes like a champ. At highway speeds, the interior of the Mirage seemed a bit louder than the Spark, but the road noise wasn't enough to hinder listening to the radio or generally talking on the phone. If I were to be doing a bunch of business conference calls while in the car, I'd probably spend $15 and get a cell phone headset to counter-act the road noise. But, to be fair, I'd also get a headset for doing those calls in a Chevy Spark. Although the interior styling is reminiscent of the 90s, the interior of the car is quite functional for commuting. The seats are comfortable enough to sit in for an hour or two and the automatic climate control works well. Three cup holders surround the stick-shift and each of the front doors has a sizable storage bin. With all those places to keep stuff, it's easy to grab something without taking your eyes off the road. The USB port is nice feature for listening to audiobooks on a long and boring commute. Unlike the Spark, the Mirage has power side mirrors which comes in quite handy when you're cruising down the road and realize that one of the mirror housings got rotated a bit. The manual transmission works fine and the shifts are smooth enough. However, there's not much shifting on the highway. It would have been nice if 5th gear was set a little bit higher to make the highway mileage EPA ratings the same for the manual as the CVT. At around 40 miles an hour, going from 4th to 5th gear only drops the engine a couple hundred RPM so it seems like there is room for improvement. Excellent owner review! Thanks for posting. Regarding the suspension: a couple hundred (or whatever it is) for a rear sway bar would reduce body roll. Any plans to deal with that, or are you happy enough the way it is? For consumers needing a vehicle that’s well suited for ... highway ... driving, you probably won’t like the Mirage due to the fact it is powered by a 74-horsepower 3-cylinder engine. ...On the few times I took the Mirage on the highway, I found it underpowered while trying to get up to highway speeds — as well as trying to cruise at highway speeds. Yttrium, I'd like to feature your write-up on the home page. Have you got a picture of your car yet by any chance? welcome Yttrium, whats steering on the highway like? MetroMPG, I uploaded a picture of the car. Regarding a rear sway bar, the soft suspension isn't much of a problem, but it is something that could be improved upon. To put it another way, if I could get a sway bar put on for around $50, I do it. If the cost was any more, I'd pass. That review you linked to came from 20 miles south of Dallas, TX. Doing a quick search the speed limits on the highways around there are 65ish which is no problem for the Mirage. However, if the reviewer took the Mirage between Austin and San Antonio where the speed limit is a whopping 85 miles an hour I could certainly understand the Mirage being called underpowered for that road. kalifornia, the high speed handling/steering on the Mirage is fine for most interstates in my opinion. If you expect sports car like steering/handling, you'll be disappointed. While the car feels a bit wobbly at higher speeds, it's good enough to get you from point A to point B. The interstates in Indiana are pretty straight, so steering for me is generally just going in a straight line and occasionally passing a truck or two. Some of those California freeways (Arroyo Seco/Pasadena Freeway) are like roller coaster rides and I probably wouldn't get a Mirage if I had to drive those type of roads everyday. Great review, thanks for the write up! That made the review - thanks for the write-up. The rear sway bar might be worth going for but the only way I'd know that for sure would be if I gave one of these little pups a test drive. Great review! One of the best two I believe I've read on the new Mitsubishi Mirage in fact. Mitsuman: what was the other one? Yttrium - posting on the home page shortly. Thanks again for a thorough review (you write well, too). Yeap agree, nicely written! Totally agree with your points. As an owner of a 1.0L manual transmission I can tell you that it does well on my daily travel between home and office (is it called daily commute?). It's a 65 KM one way which makes it 130 KM a day on highway which the speed limit is 75 MPH or 120 KMH. My average of up till now 12.500 KM or 7.767 miles travel distance is 5.2 l/100KM which makes it 45 MPG. Am quite happy with it.